Featuring 4K Ultra HD resolution and an immersive 20-point touch screen, the ViewSonic® ViewBoard® IFP8650 delivers incredible collaborative capabilities for 21st century boardrooms and classrooms. With astonishing 20-point simultaneous touch capabilities and pre-installed ViewSonic vBoard® annotation software, this 86” interactive flat panel lets multiple users write or draw on the screen with their fingers and styluses. With a built-in quad-core processor, as well as versatile connectivity options including multiple HDMI, VGA, RS232, RJ45, and USB ports, this display provides powerful computing for annotation and multimedia playback without the need for a PC. This display delivers optional slot-in PC capability, for more computing-intensive interactive applications. The IFP8650 features a VESA-compatible design and can be placed on a wall mount, or on an optional trolley cart for flexible installation in classrooms and corporate meeting rooms. 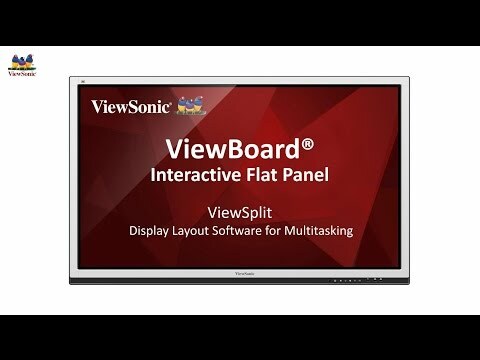 Integrated with ViewSonic vBoard and Cast software, as well as Zoom® software, this display delivers out-of-the-box annotation and content sharing capabilities. Mirroring capabilities deliver group discussion and spatial arrangement flexibility by allowing content and sound to be mirrored on to other devices simultaneously.